Han & Leia travel to Tatooine and fun afoul of a resurrected Boba Fett. Shortly after the Battle of Endor, Han Solo finds himself short on credits. Unable to convince any fellow Alliance members to front him a loan, he, Leia & Artoo take the Falcon to Tatooine, in the hopes of retrieving some funds he left with a bank in Mos Eisley. Meanwhile, the unconscious form of Boba Fett is discovered on the outskirts of the Sarlaac Pit by a group of Jawas. In Mos Eisley, Han is frustrated to learn the bank computer won't release his funds because his account was frozen when he was frozen in carbonite. Leia realizes Artoo could talk to the computer, but when she & Han return to the Falcon, Artoo is gone. Spotting small footprints nearby, they figure he was captured by Jawas, and take off in a pair of landspeeders. They track down the sandcrawler as it's being attacked by a group of Tusken Raiders. 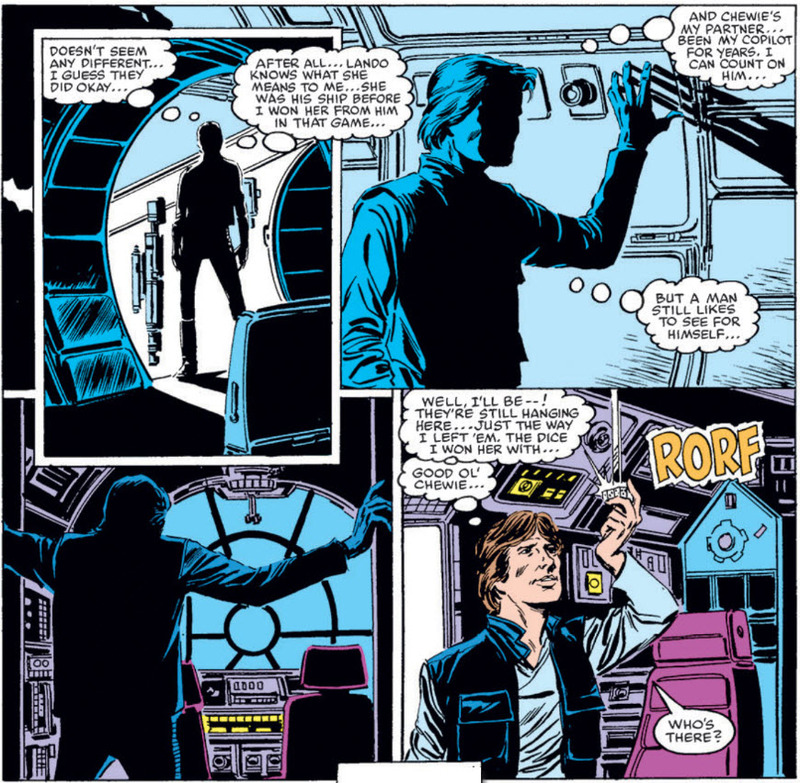 Han leaps aboard, and discovers Artoo inside along with a conscious but amnesiac Fett. With Fett's help, Han gets Artoo out of the sandcrawler. 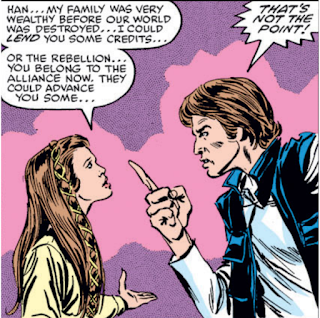 Han goes back for Fett, but as Leia calls out Han's name, Fett's memories return and he opens fire. Dodging the blast, Han leaps clear just as the damaged sandcrawler careens into the Sarlaac Pit, taking Boba Fett with it. 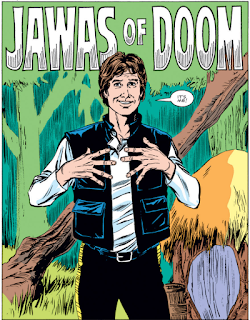 With the Return of the Jedi miniseries considered to take place before last issue and this one, this marks the beginning of the series' post-Jedi era, which will end when the series does with issue #107. 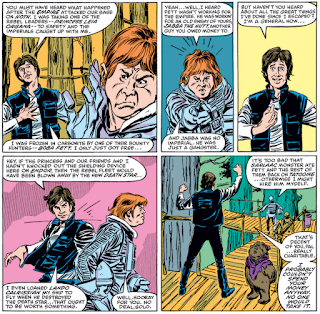 Having been rescued from Carbonite hibernation/Jabba the Hutt in the Return of the Jedi film/comic series adaptation, this issue marks Han’s return to the series. Boba Fett also makes a brief return, having been ejected from the Sarlaac pit and found by Jawas; by issue's end, he is returned to the Sarlaac, but Fett escaping death and emerging from the Sarlaac pit will become a staple of both the later Expanded Universe (in which Fett is revealed to have survived in Dark Horse's first Star Wars miniseries, Dark Empire) and the current Disney canon (in which it's heavily implied that Boba Fett at least escaped the pit in Chuck Wendig's Aftermath novels; it's not yet clear, however, if Fett survived long after that). 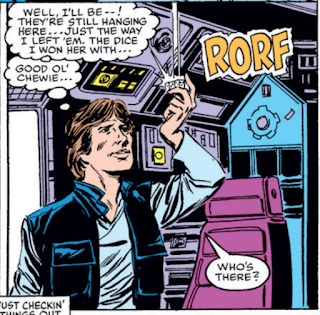 In the wake of the Empire’s defeat, Han finally gets a chance to properly reconnect with the Falcon. Han’s dice - which served as a plot point in both The Last Jedi and Solo - are referenced as he does so, though their origin is different (here, Han says they’re the dice he won the ship with; Solo shows him in possession of them before the ship). 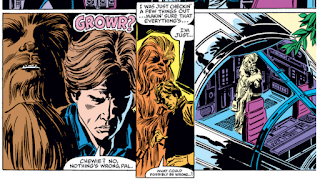 There’s also a really sweet moment between Han and Chewie after Chewbacca finds Han aboard the ship, and they embrace. Leia sports a new look in this issue, a white jumpsuit with padded shoulders in the style of the Alliance Hoth uniforms. Somehow, word of Boba Feet’s fate and the events surrounding Han’s rescue have already made it to the ears of rank-and-file Rebels. 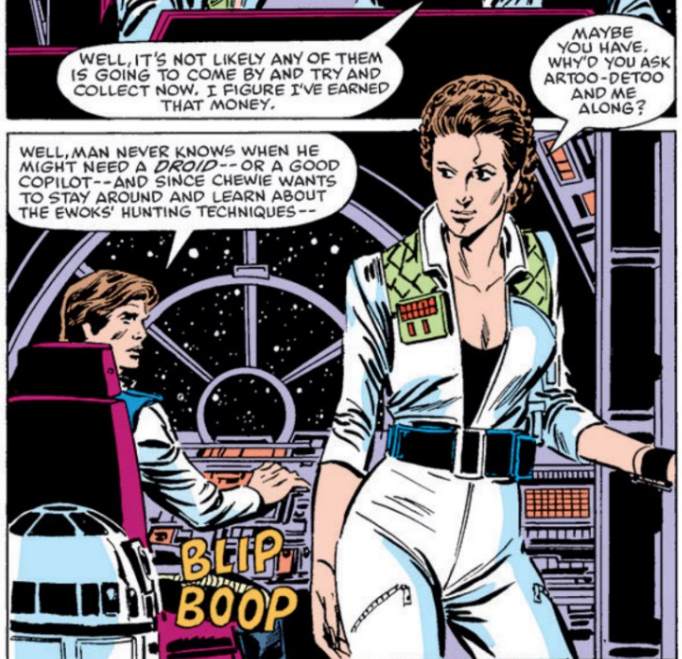 Leia offers to float Han some money, which seems odd since you’d think whatever money she had would already have gone to the Rebellion. Remember The Empire Strikes Back & Return of the Jedi? 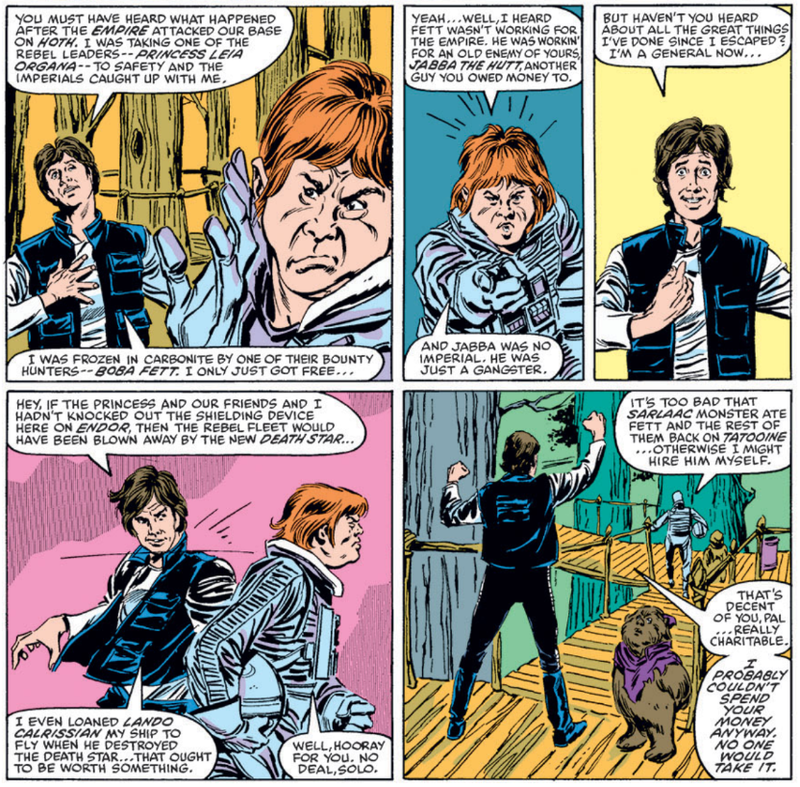 Han provides a handy recap of his Empire fate and the events of Return of the Jedi to an unimpressed Rebel he’s trying to get a loan from. This issue represents both the strengths and limitations of this series. 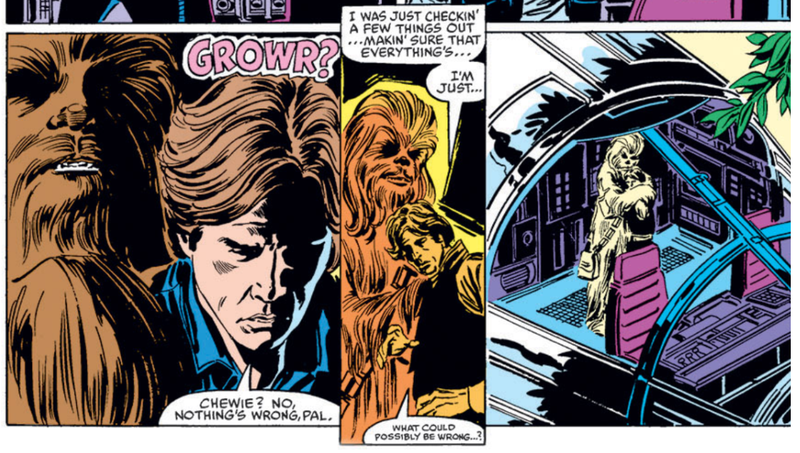 The first half features the kind of thing it should do more often, as Han is shown reintegrating with the Alliance (in microcosm, via one particularly-unimpressed Rebel), then gets a moment to appreciate being back in the Falcon before he and Chewie get a chance to reconnect. These kinds of quieter, character-focused moments, able to occur free of the immediate threat of Jabba and the need to destroy the Death Star, highlight the book's ability to deepen & expand on things featured or implied by the films, but which the films' doesn't necessarily have a lot of time to dwell on themselves. After that, the issue transitions into a more traditional action/adventure story, albeit with the added impact of Boba Fett's return. And that return illustrates one of the series' big handicaps. Bringing back Boba Fett is exactly the kind of thing this book should be able to do, dusting off a minor but popular character and expanding his story. But because this is a licensed comic, and LucasFilm presumably put the kibosh on a full-on Boba Fett return, the issue has to end with Fett right back where he started, which pretty much robs the story of any lasting impact. It’s a reminder that, as much as the series can do things like explore the ramifications of life after carbonite deep-freeze, there are limitations on how far it can explore. Luke gets to play diplomat. I have a hard time reconciling Boba Fett’s portrayal in the Empire Strikes Back and Return of the Jedi. They behave as different characters. In the second movie, he’s highly efficient and cold. In the third, he’s an incompetent buffoon who screams like an idiot because of his jet pack malfunction and dies in the most humiliating form. Now here’s what I never understood: George Lucas clearly understood that Boba Fett was a popular character, enough that he added him and his “father” (along with the idiotic clone backstory) to the prequels. Of all changes he made to the original movies, why not cut the part in which Boba Fett dies? I’d stop the scene when he hits the side of the floating barque, leaving the audience to think that he was merely knocked over. For me, it seems that his death is canon. If it weren’t, he’s have been brought back to the sequel trilogy, even in a cameo. Although since I strongly believe that Rian Johnson despises Star Wars and its fans and made one of the most elaborate trolling in history, I think it’s never cross his mind to bring back a popular character. From what I understand, George Lucas considered the tie-in novels to be canon, until the big "relaunch" for the sequel movies. So, it was considered canon that Boba Fett went in to the Sarlaac pit, but then in the novels (and the Dark Horse comics), it was shown that Fett did survive. That may be one reason that Lucas didn't "ret-con" Fett's death when he meddled with the original movies. The novels and Dark Horse series already showed how Fett managed to survive. The novels and Dark Horse comics fleshed out Boba Fett so much more and made him in to an almost Wolverine-level characrer. Eh, just mark down the events of Return of the Jedi as Fett having a really bad day. Everyone has those off-days once in a while. That was he equivalent of Wolverine crying after Proteus messed with him in Uncanny X-Men. It was just one of those days for Wolverine. Now, with the relaunch of the franchise, and the original novels and Dark Horse comic all being considered non-canon, it may be true that Boba Fett did truly die. "I strongly believe that Rian Johnson despises Star Wars and its fans and made one of the most elaborate trolling in history"
Nothing could convince me that you or anyone else believes that a person would waste 2 years of their life producing something they hate. In the second movie, he’s highly efficient and cold. In the third, he’s an incompetent buffoon who screams like an idiot because of his jet pack malfunction and dies in the most humiliating form. What does he do in EMPIRE to demonstrate that he's efficient & cold? We're told he's good ("No disintegrations"), but all he really does is think to hang out in the garbage and watch for the Falcon. After that, he just follows Vader around and watches as the slabbed Han gets pushed onto his ship. Sure, he *looks* cool, and *seems* cool, but he really doesn't do a whole lot. I think the fandom just (understanably) latched onto the cool visual and aura of mystique and made him out to a bigger deal than he was. I don't think Lucas ever intended for him to be more than a jobber. His death-by-malfunctioning-jetpack in JEDI ties in with the larger theme of that movie, about how pride in technology leads to downfall, and more centered, natural approaches will win out in the end (ie Jedi/Ewoks vs. Sith/Empire). Even when Lucas brought back the Fetts for the Prequels, he used them to underline the theme again - Jango dies because his jetpack is damaged and unable to carry him away from Mace's attack. If it weren’t, he’s have been brought back to the sequel trilogy, even in a cameo. Technically, he could still return in the Sequel trilogy. Or, perhaps, the Mandalorian TV show (which would, on the surface, seem like an easy spot for him). I think it’s never cross his mind to bring back a popular character. To be fair, we don't know what we don't know. Maybe Johnson begged to bring back Fett in LAST JEDI and LucasFilm nixed it (maybe because they already have plans for him). Maybe he was told explicitly "no Fett". Maybe it never came up because there was no place in the story to work him in organically in a way that wasn't just a throwway cameo that served no narrative or thematic purpose. In general, Disney Star Wars seems reluctant to throw in cameos just for the sake of fan service (sure, it would have been easy to make Lando the codebreaker in LAST JEDI, but do we really want Lando back just for a cameo? Wouldn't it better to integrate him into the story - to continue *his* story in the process - as they're reportedly doing in episode IX? ), and they're probably right in that reluctance. Huh. I never noticed that as an unifying theme of Return. Yes, of course, it was always obvious with the Ewoks. However, that meant to draw real-world parallels with the situation involving the American invasion of Vietnam and the Soviet invasion of Afghanistan. Which makes the Special Editions (for a start) hella ironic. @Anonymous: It's definitely not as prevalent a theme as it is in STAR WARS (where Tarkin is basically like "Nothing can defeat Technology! "), but I think it ties in with the whole "Ewoks as the Viet Cong/effectiveness of guerilla warfare" themes. 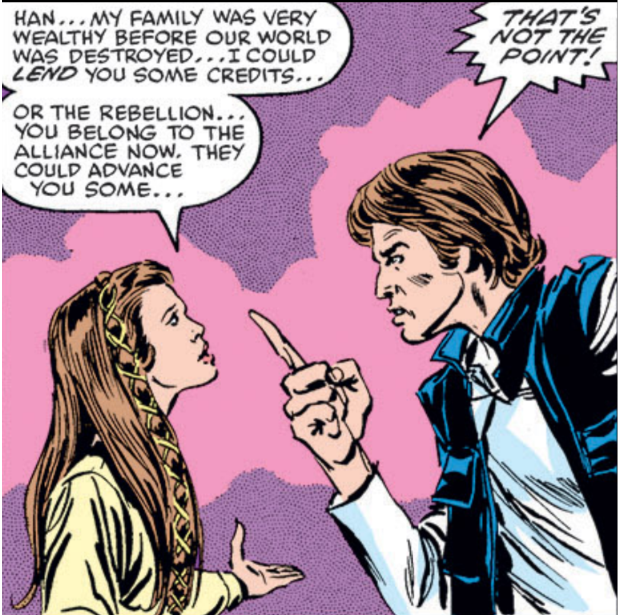 @Blam: Yeah, there's several layers of irony there, given the trajectory of Lucas' career post-Original Trilogy. I didn’t think landspeeders had the kind of flight capability depicted here — we see them a good couple of stories off the ground and banking at close to a 90° angle. 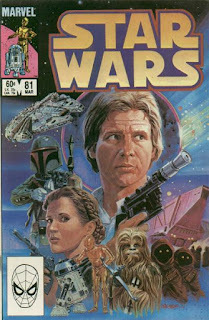 That’s a great cover but a sad reminder of how middling even the better likenesses tend to be within any given issue — and by extension, for me at least, how only the films are real Star Wars. I’m with you, though, on how the start of this issue is a strength that the series should play to more often. Even with Han’s amusing bureaucratic Catch-22 snafu (very his kind of luck that he can’t access his account now that he’s free from the carbonite because he’s supposed to be frozen in carbonite), however, and the welcome acknowledgment that the Emperor’s defeat hasn’t effected much immediate change in place like this, Han and Leia’s Tatooine adventure is not enough to distract me from how Leia should be participating in the reconstruction of the Republic in these crucial early days post-victory, absent a scene where she makes her case for a brief excursion with Han to her fellow Alliance leaders or even just to herself. Spoiler alert, you can copy/paste this comment next issue (you're also not wrong to be bugged by this). The lettercol in #85 notes that the coloring was miscredited this issue and next; it was done by Ken Feduniewicz, not Glynis Wein. Just an FYI in the name of posterity.